I would say with confidence that fall is here and here to stay. We had both snow and rain with more on the way, and temps are ranging from the high 30’s to 40s’ for the rest of the week. As Steve mentioned in the last report, the battle of the seasons has begun and I’m pretty sure fall is about to knock out summer very shorty. Actually based on the weather, the knockout should be taking place on Thursday with scheduled snow throughout the day. Despite the persay colder, uglier weather the fishing here has been quite good. 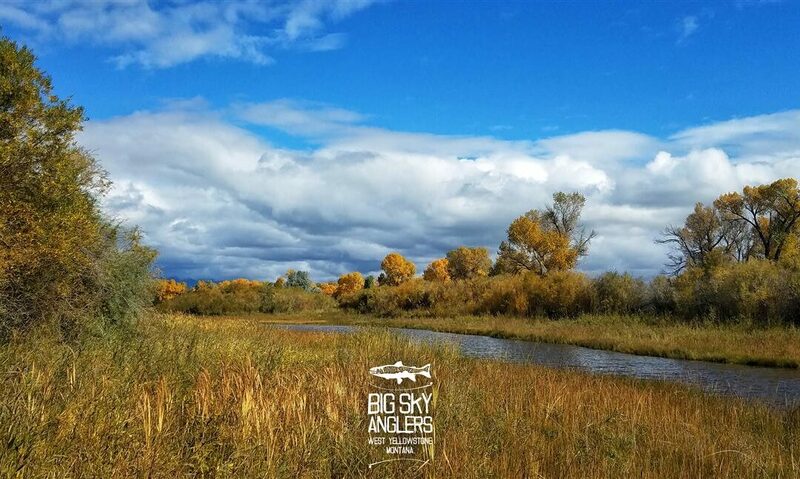 From the Henry’s Fork to sections of the Park and the Madison in Montana, we have fishing to satisfy any type of fall angler. As far as surface bug activity is concerned we continue to see Baetis, Caddis, Tricos and Pseudo’s. For subsurface activity, emerging stages of these insects can be mimicked with size 12-16 soft hackles both swung on a tight line or dead drifted. Streamer fishing the Madison on these blues feeling days, both in Montana and the Park along with the Henry’s Fork around Ashton can find you very pleasing fish that are guaranteed to put a smile on your face. The Fork around Last Chance can give you some great opportunities at some good fish on drys as well. As far as preparing to fish within our little 60 mile radius here in West Yellowstone, I would say have a 4wt for smaller water in the park like the firehole, a 5wt for your bigger water Baetis fishing on the Madison/Henry’s Fork and a 6wt for all your streamer’s. Oh, I almost forgot, dont forget your euro nymphing rod if you’ve got one. Come in and pick Roberts brain here at the shop if you are less familiar with euro nymph fishing or want to up your game. So if opportunities of colored up browns and hot rainbows or delicate presentations with dry fly imitations interest you, I’d say you’re in luck. A large percentage of our fishing being done in the park is locally here on the west side. Both the Madison and Firehole Rivers are great places to fish but two very different waters. Right now, as many of you know, the healthy, mature, Browns and a unique fall-run species of Rainbow are venturing their way up the Madison towards their spawning grounds further up river. As far as targeting these fish its a kind of pick your poison type of deal. Swinging soft hackles, nymping and streamers are all an option. These migratory fish don’t rise very readily do to the nature of their physical state but some areas of the madison do have the type of waters and conditions so be on the lookout. Then you have the Firehole, which has the most bug activity given the geological features which make this water unique. Hatches of Baetis can been seen through the afternoon and can be fished with drys and, swinging smaller soft hackles or nymphing. Swinging smaller leeches and streamers is a fun choice as well. Nothing drastic has changed as far as our last report, but I would say with dropping temperatures and flow changes the Browns in these waters will be feeling a little more frisky. On brisk, wet days Baetis can be seen later in the afternoon. Focus on slicks and softer water where little nypmhs have a chance to swim up and hatch. Imitating the emerging stage of insects with soft hackles or something with a little CDC within the first foot of the water column could also be a unique way to catch these fish if it’s not really happening up top. On cloudy days break out the streamer rod for more aggressive fish. Swing it in the runs, strip it in the buckets and high stick it in the pockets. The most effective streamer fishing is going to be with a sinking tip line but you could use a floating line for shallow pocket waters. It’s October and that means some of the BSA crew is up on the MO stripping streamers and headhunting for those grand Missouri River trout. Joe, Jon, Hoovie, and Earl are all guiding up there now, and many of the other BSA crew members are swinging through for some fun fall fishing. Gray, scuzzy days have generated some of those monstrous hatches of fall Pseudos that the Missouri is famous for. A few larger Baetis have been seen in addition to a mysterious, cream-colored mayfly that we are trying to identify. In between pods of rising fish, small streamers fished on floating lines or light sink tips have kept the crew busy. Stay tuned for more reports from the Mighty Mo through the end month. Over on the Henry’s Fork you’ve got a little bit different climate given the slightly lower elevation compared to West Yellowstone and YNP, but somewhat similar fishing game in general. Beatis and Pseudos around #20 are the ticket when it comes to dry fly fishing both around Ashton and Last Chance. If you’re fishing the Railroad Ranch section of the Henry’s Fork at this time of year you’ll likely see very few people and find some good fishing. The bugs aren’t very big bug but cool, cloudy days can produce strong hatches. As always, long Leaders and and small flies are a must here. The drag on those small drys is much more noticeable because of their size so be sure to bring your best game. Fishing streamers on the lower river below Ashton will be good with streamers, nymphs, and dries as well. Those Browns will be in a similar mood as the fish in the Madison system near West Yellowstone. Late autumn is an often overlooked time of year to target stillwaters, probably because there are so many other outdoor activities to do, and because getting stuck float tubing when a snow squawl blows in is about at Type 2 fun as things get. Between fall streamer fishing, dry fly head hunting during baetis and Pseudo hatches, and big game and bird hunting, the lakes are often ignored. Stillwaters can be moody at this time of year, with passing storm fronts changing conditions from day to day. But the trout know that a long winter is coming, and they are feeding HARD when conditions are suitable. Think bigger in terms of fly selection, as leeches and baitfish have replaced the small mayflys of summer as a main food source. As vegetation dies back, scuds are also left homeless and wandering, making for an easy snack for the fish.